Flowers always create a beautiful theme for a wedding. Enhance the concept by selecting a signature flower which embodies the spirit of the season. Learn how to design a beautiful spring wedding with a daffodil theme. Daffodils are one of the perennial signs of spring. Fresh and cheerful, they would be absolutely delightful as the theme for a spring marriage celebration. When a flower is your signature motif, naturally the bouquets and centerpieces will become a key part of your design. The signature flower can also be used on invitations, the wedding cake, and much more. 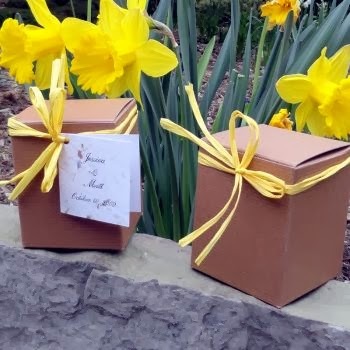 The great thing about daffodils is that they come in a variety of color combinations and sizes, so you can plan a very interesting wedding around the single design concept. 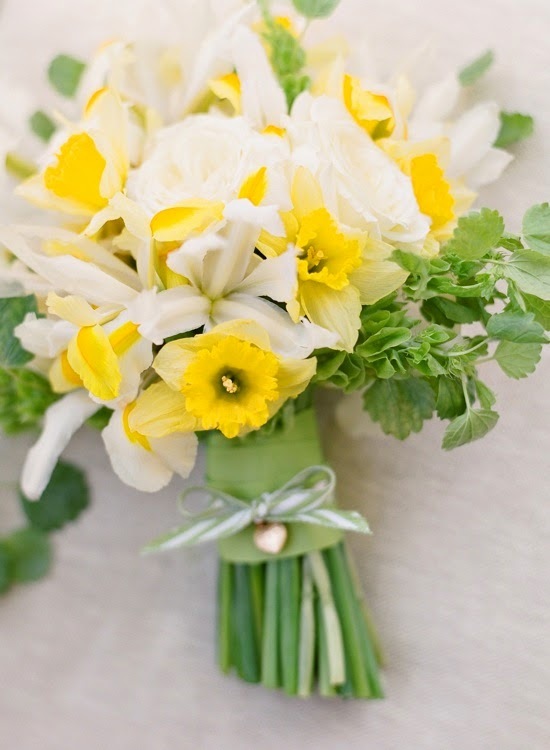 A simple bouquet of white daffodils would be ideal for the bride. Tie it with a pale yellow satin ribbon to dress it up, or choose a fun check or stripe ribbon for a more casual flavor. This would be a lovely bouquet to carry with a white lace or organza wedding gown worn with pearl bridal jewelry. A pearl headband would be a pretty complement to the bridal jewelry. For the bridesmaids, a beautiful bouquet would be one created from several colors of daffodils. Mix all yellow blossoms with yellow and white, yellow and orange, and orange and white for a fresh-from-the-garden appeal. 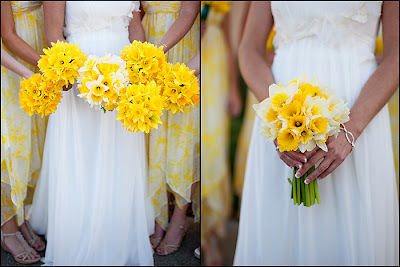 The miniature daffodils would be just right for a junior bridesmaid or flower girl to carry. 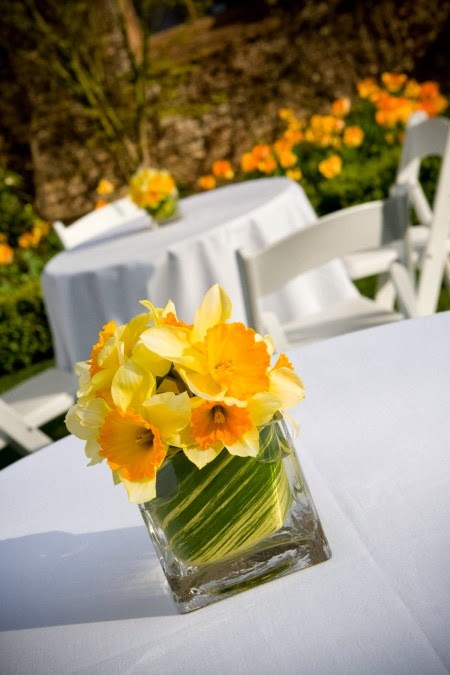 As for centerpieces for a daffodil theme wedding, choose several varieties to combine for visual interest. Spring bulbs always look fantastic when displayed as potted plants, so one centerpiece idea is daffodils which are planted in pretty pots. Cover the soil with moss or smooth pebbles for a finished look. Daffodils also look pretty when displayed very simply, so another great centerpiece option is arrangements of cut flowers in clear vases. A trio of vases with different colors of daffodils will keep the design from looking too simple. If you wish for more formal centerpieces, combine yellow and white daffodils with other spring blossoms such as sweet peas and tulips. Certainly the wedding cake offers the perfect place to showcase your wedding theme. 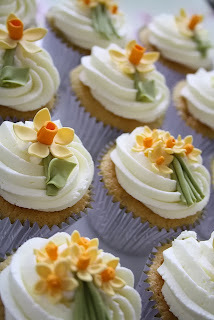 A charming idea would be to top a pale yellow buttercream cake with a tiny basket filled with sugar daffodil blossoms. Another pretty cake idea is a white buttercream cake with gingham ribbon wrapped around the base of each tier. 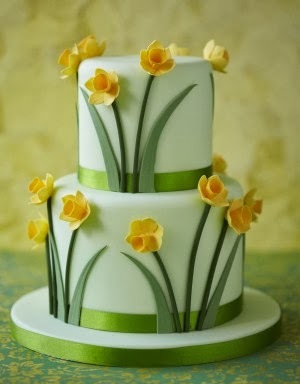 Add clusters of sugar daffodils around each tier in a scattered design. Keep the inside of the cake as light and springy as the decorations by choosing a classic white cake or a lemon flavored confection. 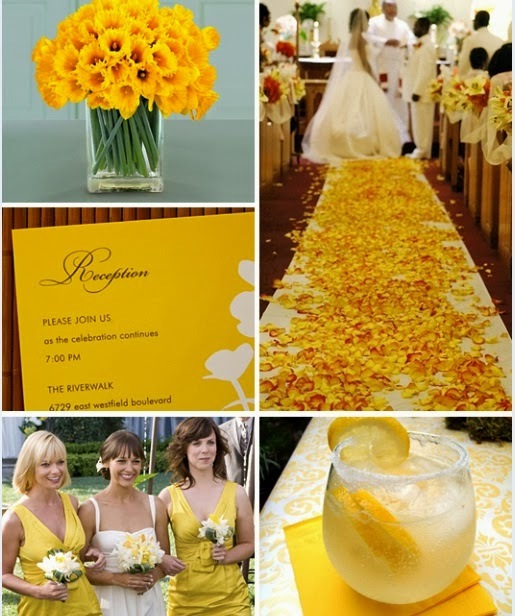 There are many more ideas for incorporating a daffodil theme into your wedding. A fun wedding favor idea is tiny pots with a single blossom or even a fancy bag with bulbs that guests can take home and plant. 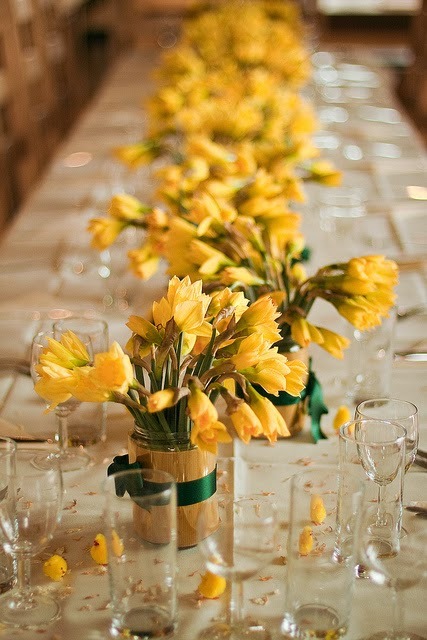 The white and yellow colors of daffodils can be carried throughout the wedding decorations and table linens for a cohesive design. Add touches of light green for just a hint of contrast. Without a doubt, a daffodil theme is a fresh and fun idea for a spring wedding.